Courtesy of the South Korean Embassy to Israel. Close to 50 million people live in South Korea and everyone learns Gemara (Talmud) in school. "We tried to understand why the Jews are geniuses and we came to the conclusion that it is because they study Talmud" said the Korean ambassador to Israel. And this is how "Rav Papa" became a more well known scholar in Korea than in Israel. But unlike in Israel, the Korean mothers teach the Talmud to their children. "We were very curious about the high academic achievements of the Jews" explains Israel's ambassador to South Korea, Young Sam Mahthat, who was a host on the program "culture today." Jews have a high percentage of Nobel laureates in all fields: literature, science and economics. This is a remarkable achievement. We tried to understand what is the secret of the Jewish people? How they - more than other people - are able to reach those impressive accomplishments? Why are Jews so intelligent? The conclusion we arrived at is that one of your secrets is that you study the Talmud. "Jews study the Talmud at a young age and it helps them in our opinion to develop mental capabilities. This understanding led us to teach our children as well. We believe that if we teach our children Talmud they will also become geniuses. This is what stands behind the rationale of introducing Talmud Study to our school curriculum." "It is considered very significant study" he emphasized. The result is that more Koreans have Talmud sets in their homes than Jews in Israel. Yes this article is interesting. Just the day before yesterday, I was in the class I attend in Talmud (gemora) here in Israel with a bunch of young Israeli boys. There are about 25 in the class and they are about 25 years old or so. We were doing a complex case in the gemora that lent itself to three different possibilities of understanding. Two of these viewpoints completely denied the other's validity. As we strived to understand the rationales behind the divergent opinions, an argument broke out in the class as to how to understand one of the more extreme viewpoints in view of several problems in logic that were presented. The teacher was arguing with two of the students who opposed his explanation. In the meantime small groups of students began arguing with each other until finally it appeared as mayhem had fallen into this class. I looked around the class and saw all of these young people were involved with each other in a very heated discussion. I think I was the only one who was not giving an opinion or refuting someone else's' opinion. Suddenly as I watched this scene unfolding before my eyes, I broke out laughing. I remembered my days in college and how we would sit so quietly listening to the teacher or professor only asking a question if we did not understand something but never to challenge the teacher's ideas. Challenging a teacher's idea or opinion would never be accepted in my college. But here in the Talmud class it was just so different. Challenges to logical thought based on finding discrepancies in logic are the rule. The students were so much involved in the logical analysis of the gemora that in their passion to understand the various possibilities that they began heated arguments between themselves that totally shattered what you might think would be the quiet serious decorum of a class room environment. Each student was so intimately driven by a desire to understand the various possibilities of how a statement can be understood that they had created a room of students striving with each other to arrive at the truth. Each point of logic had its support but also a question that could prove it faulty. After a few more minutes of pandemonium, the arguments were silenced by the teacher and we continued in a more orderly fashion. But with all of the argument, there was no animosity between the teacher and students or between the different students. Just the opposite, the teacher welcomed the challenges posed by his students because, 1) it shows that they take the studies seriously and that they care and understand the material being studied, and 2) it sharpens up both the teacher's mind and the students' mind. When the class finished everyone left as friends, even more than before since their argument contained nothing personal; it was not about the people but about understanding the logic and arriving at a sound conclusion. It was a highly charged and lively discussion that brought minds together. Compare this method of learning to that in the standard high school or college class and perhaps you will understand that it is not only the material studied but also the method (could also be the brain too, but then again somehow I got in to the Jewish learning and with my puny brain, it is certainly not only brain power). I never remember any students getting into any arguments about the subject matter in college. Rather we just tried to read, understand and memorize; all this effort was only to pass a test and passing the test was only to get a degree and getting a degree was important only to get a job. It was not so much the material studied that mattered but the end result: the job. Tests in Yeshivas are not the main method of getting boys to learn in yeshivas, some don't even give tests. The concept is to involve the mind in the subject matter to understand the logic and faults in the subject. This is the real standard of learning. Passing a test based on memory has merit, but total involvement of the person in the topic of study is even more important. Above was the email I sent to my brother-in-law. After sending out this email, I began to think about Koreans learning the gemora. To read the Talmud, one must be proficient in both Hebrew and ancient Aramaic. It takes about four to five years to develop skills needed to understand what is going on. In addition, to just reading the page and understanding the page, one must read Rashi's (1040-1105) commentary; that is the starting point of understanding. Rashi, in the original Hebrew/Aramaic is full of subtle points that take a trained eye to see. Afterwards there is on the opposite side of the page the commentary of the Toshphos, a school of Talmudic learning that was started by the grandsons of Rashi. The study of the Toshphos is very difficult and requires much though and probing than that needed for understanding Rashi; Toshphos seems to bring down problems in the current topic from other places in the Talmud. Learning the gemora with Rashi and Tosphos is not the end. One must include seeing the commentaries of the Rabbi Yitzhak Alfazi, ( Rif) or Rabbenu Yona, or the various other commentators who are known by their initials more than by their names. Each one of these great rabbinic commentators adds a different perspective to the analysis of the gemora. Then there is the coming to earth with the relevant halacha (Jewish law). The Talmud has long been translated into English (as well as other languages). The first English translation of the Talmud was done perhaps fifty years ago by the Soncino Publishing Company. I remember trying to learn from it some forty years ago. I gave it up as an impossibility and a futile waste of time and instead put my energies into mastering Hebrew and Aramaic. In recent years the Talmud has been translated again into English by another group. It is known as the Art-Scroll Talmud. Still, no Jew has ever really achieved much more than a superficial understanding of the Talmud from these English language editions. I wonder how the Koreans who have no prior knowledge of the intricacies of the Talmud and perhaps little knowledge of the Jewish Torah or Jewish halacha can hope to achieve much from reading a Korean translation. Couple this with the fact that the outcome of the arguments concerning Jewish law has nothing to do with them personally. Does a Korean keep Shabbat or the Festivals that he is going to care what side of the egg came out first? 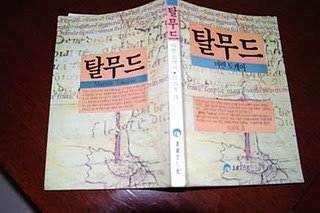 Can a Korean student argue with the same passion and intensity about a subject that really does not concern him? If the Koreans are smart enough to gain a serious understanding of the problems raised by the Talmudic sages, then they are so intelligent, they probably do not need the Talmud. I came to the conclusion that the original story about the Koreans studying Talmud has been blown out of proportion. Perhaps there is a Korean translation, but the mothers' teaching their children Talmud? Who taught them? That everyone in Korea learns Talmud? I kind of doubt that. I guess it is my Talmud training that makes me skeptical of the above email as a near hoax.